the beatings go on . . . 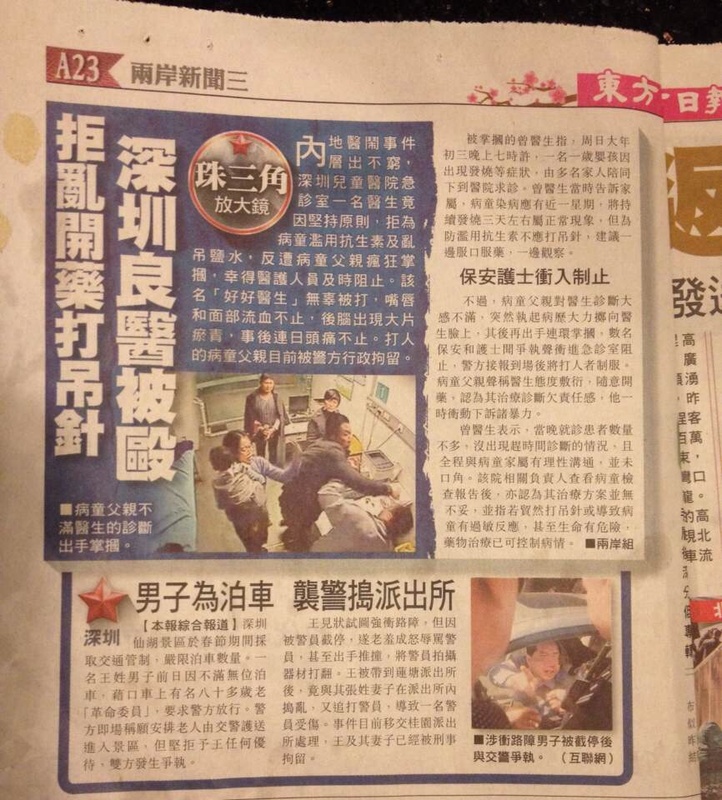 The article title is “A Good Shenzhen Doctor was Beaten, He Refused to Prescribe Unnecessary Medicine or Vitamin Drip”. The article reminds Shenzhen readers that although it is common to abuse doctors in neidi, it has not been common in Shenzhen. Moreover, as the article points out, often the beatings occur even when the Doctor is doing her job. The use of the word “good doctor” and the assumption that sometimes doctors deserve to be beaten for (corruption, expensive medicine, fill in the angry blank) underscores the tense relationships between patients and doctors in China generally, but also Shenzhen, our low number of reported conflicts notwithstanding. As in the US and elsewhere, in contemporary China lay people assume that role of medical care is to return patients to perfect health, immediately. More distressingly when this result cannot be obtained, patients and their families assume that their ongoing dis-ease is deliberate and that the Doctor is withholding care in order to receive a bribe. Hence, the beatings. In my experience, it is important to know one’s doctor because some Chinese doctors do put a price tag on treatment. Sometimes they do prescribe expensive, unnecessary treatments. Like US doctors they often preen and show off their knowledge. But more often than not, like their patients, Chinese doctors are caught in an ugly web of mistrust and impossible desires. Doctors cannot heal everyone all the time, and they are shackled by all sorts or regulations and administrative cost. Moreover, as in the US, hospitals and clinics do turn away those who cannot pay but won’t die from lack of treatment. Also as in the US, patients want the best modern medicine without paying for it and often those who can afford medical care oppose government subsidies for those who cannot. But there’s the rub: except for the very rich few people can afford out-of-pocket treatments and so they only go in when very sick or for antibiotics and other instant (preferably cheap) cures. There is little conversation about general prevention, and less about two unavoidable facts–our collective lifestyle makes us sick (cancer and diabetes, for example) and despite all our technology, we will get sick, age, and die. Hopefully, with grace and dignity. The hope for graceful lives and dignified deaths changes the conversation about whither medical care. As a society, we need investigate what it would mean to provide equal and gracious access to care. We need to think seriously about what constitutes a dignified death. And we need to take responsibility for the contamination that our dependence on petrochemicals and nuclear power has introduced into shared environments because not only humans are suffering from our hubris. This entry was posted in noted, shenzhen elsewhere and tagged Chinese doctors, medical care, medicine, shenzhen, social conflict. Bookmark the permalink.